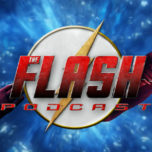 On this week’s episode of The Flash Podcast, Andy Behbakht, Amy Marie and Brittany Rivera are joined by Kat Calamia from the Legends Of Tomorrow Podcast, as they review the thirteenth episode of The Flash Season 3 titled “Attack On Gorilla City”, Part 1 of the Grodd two-parter. In this episode, Team Flash goes to Earth-2 to save Harry Wells from Gorilla City which is ruled by Solovar, a new villain that Gorilla Grodd needs help to defeat. The gang also read listener feedback about “Attack On Gorilla City” before going on to the preview session for next week’s episode titled “Attack On Central City”, Part 2 of the Gorilla Grodd arc. That and more on the latest episode of The Flash Podcast!